Posts about available puppies, puppy stories, puppy advice, puppies, puppies, puppies! Everybody loves puppies! One of the greatest insults folks jokingly make when they are describing someone they don’t like is, “he probably hates puppies!”. 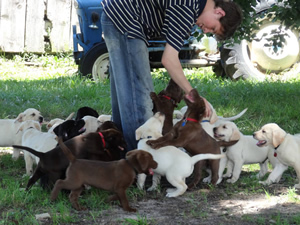 Lots of folks call me up, eager to get on the waiting list for a new puppy, ANY puppy. Quite a few are turned away, either permanently, or for the litter that I have available. Why? Raising a puppy is no easy task. It takes dedication, lots of time and attention, proper training and a willingness to give him or her the quality of diet and medical care that will keep them healthy and bring long life. The cute, fuzzy puppy doesn’t last all that long! SHOULD YOU EVEN HAVE A PUPPY? That’s the first question to ask. Here’s a good rule of thumb, and one of my basic requirements for placing a puppy in a new home: There must be human companionship for the puppy throughout the day. If both adults work, and the pup will be left home for 4-8 hours a day, you should NOT get a puppy. If folks are away 3 or 4 hours a day, I will make an exception if the puppy will have the companionship of another dog or puppy. Puppies are far too social and needy to be left home alone for long periods of time. They will get bored and usually destructive with chewing and such, and with nobody around to consistently train that behavior, it only gets worse. Then when the owners get home (and pick up all the destroyed books, paper, shoes, and examine the chewed furniture), the pup is a neurotic basket case that is actually not that much fun to be with, and is out of control. I can’t tell you how many times I had puppies returned to me back in the early days when I did not screen buyers as carefully as I do now. 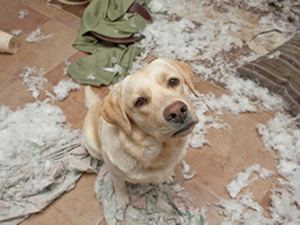 I would take back puppies that were said to be “out-of-control” and “untrainable” and “destructive”. After one week of being here at the farm with us, playing with the dogs, and doted on by my family members, they were like new dogs! Those dogs are all grown now, with never a complaint ever heard from their new owners, who were carefully screened. So, am I saying that working folks shouldn’t have a dog? NO! I’m saying they shouldn’t have a puppy. Those families are excellent candidates for adult dogs that are fully past the puppy stage and can take being alone without going nuts. Even then, you need to find a dog that has lower drive and calmer temperament. I have adopted out some of my retired breeding dogs to such families, and it works out really well. I have also found that older couples of retirement age have a high rate of puppy return. They often are convinced they have the energy to raise a puppy, but it turns out to be a bit more than they realized it would be. I have had three such returns in the last two years. I have also had some very successful situations involving retirement-age couples. I don’t necessarily refuse them, I just want them to strongly consider the work load and commitment involved, and make sure they are up to the task. Our American lass, Cami. Always playing. WHAT “TYPE” OF PUPPY SHOULD YOU HAVE? This is an important question. If you want a dog that is primarily a house pet and will lead a fairly sedentary life, you definitely don’t want an American Lab! Field Labs have a high drive that is easily trainable, but MUST be trained, or you will have a serious troublemaker on your hands. They are very affectionate and intelligent, but they are always looking for something to do. 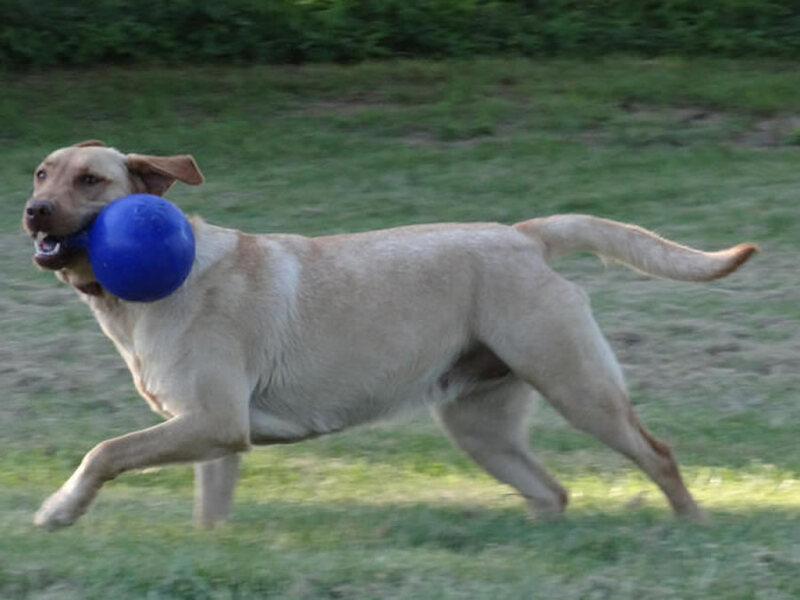 If you lead a very active life, have a yard at your home, love to take your dog to the water, they have opportunities to run and play often, the American Lab is perfect for you. You will find their companionship to be the most satisfying type. If you are looking for a hiking, running or hunting companion, perfect! English Labs have a tendency to be lower drive, some with very little drive at all, virtual couch potatoes (after they are past the puppy stage). That sometimes makes them more difficult to train, because they are not as eager to do stuff, and to please you. But they are often better behaved as house dogs for that reason. They also have a tendency to be larger in size. 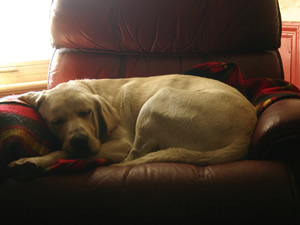 Some are actually very agile and love high activity, but are still of a much calmer demeanor than filed Labs. 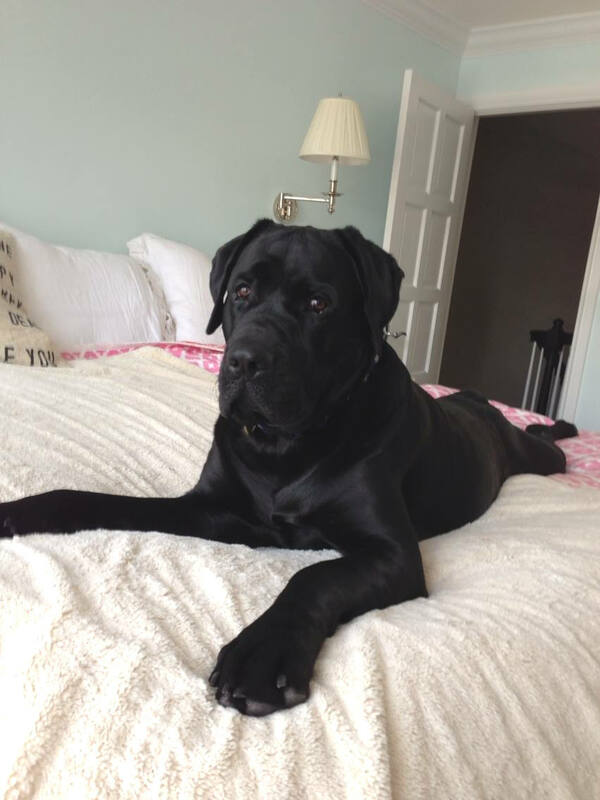 English Mastiffs make great house pets or outdoor pets. They aren’t necessarily great running or hunting partners, but hiking and walking are great for them. They love to be physically close to you, even touching you, so they make great therapy dogs and mobility assistants. Mastadors are the best of both worlds (if you can find them) They are more agile and playful than Mastiffs, less high-drive and rambunctious than Labs. They love the water, love to run and play, love to lay around and just be near you. The perfect puppy for you may be not be any of the dogs I breed. Perhaps you need something smaller or hypoallergenic. But I urge you to carefully consider all of these things before you are just plunge headlong into puppy parenting because of the super cute pictures on a web site. This is a 10-15 year commitment on your part. Keep that in mind right up front. This entry was posted in PUPPIES! on May 27, 2015 by PuppyMan.